Leading German and Humber offshore wind and ports business leaders met at the University of Hull yesterday, as part of a high profile inward trade mission. Daniela Behrens, Lower Saxony’s Secretary of State for Economy, Labour and Transport, headed the trade delegation organised by Team Humber Marine Alliance. 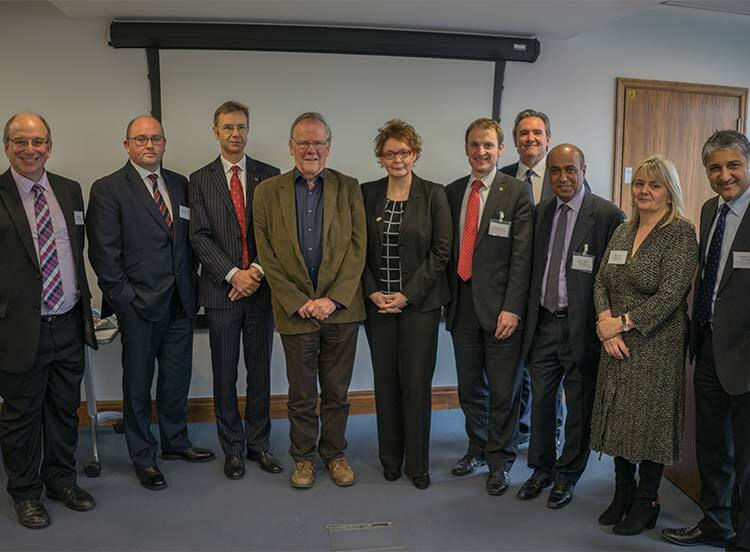 CEOs and directors from more than 20 German businesses and organisations attended a morning of networking, talks and presentations by leading Humber offshore wind and renewable energy figures at the University of Hull. The trade mission, part of Offshore Wind Week, came in the wake of news from Siemens of its plans to build a factory in the Lower Saxony port of Cuxhaven. Mark O’Reilly, CEO of Team Humber Marine Alliance, said: “The Cuxhaven factory is a similar investment to Hull and was selected for the same key reason as Hull – a portside location with available space and in close proximity to North Sea offshore wind farms. “Cuxhaven’s similarities and investment will have a comparable regenerative impact and this is a great opportunity to build relationships with a region that in many ways reflects our own. “The Humber has excellent existing trade connections with the Lower Saxony region which sees daily shipments of vehicles, steel, specialist cargoes as well as RoRo ferry services between Grimsby, Immingham, Emden and Cuxhaven. The University of Hull has an increasingly broad and in-depth involvement in renewables and offshore wind, including delivering environmental impact assessments around the Humber estuary to help unlock project developments. HIVE, the University’s virtual reality facility, is also being utilised within the industry for simulating offshore wind farm environments and was recently used at a Siemens recruitment event for its Green Port Hull factory. Renewables are a key academic and business development sector for the University’s Logistics Institute, with expertise in UK and European green energy development such as raw material and product supply chains and enterprise support for project contracts. Professor Amar Ramudhin Director of the University of Hull’s Logistics Institute said: “This is an important trade visit with a focus on the offshore wind industry and its impact on our respective regions as well as future cooperation. Companies in the German delegation include Buss Ports Logistics, EWE, Freitag Prototypen, Hannover Airport, KRD Coatings, Niedersachsen Ports, Noste Transport, Rhenus Cuxport, Schone & Bruns, Stalhbau Menke, Vornbaumen Stahlseile and Wurst Stahlbau. Hans-Peter Zint, managing director of Cuxhaven Port, said: “”Offshore wind is a truly European cross-border project with the North Sea as its centre. The Humber and Cuxhaven regions share a similar economic history. Dominated for too long by the decline in fishing and other traditional maritime activities offshore wind now brings the chance of sustainable economic development for our regions. There will be around 20 invited senior level Humber attendees, including from A2SEA, ABP Humber Port, Able UK, Andrew Jackson, DFDS, the Humber LEP and Green Port Hull. Delegates will hear presentations by, among others: Prof. Amar Ramudhin of the Logistics Institute; Lord Haskins, chairman, and Kishor Tailor, chief executive, of the Humber LEP; Gareth Russell, business development manager of ABP Humber Ports, and David Shepherd, group development executive of Able UK and Able Marine Energy Park. Academics and business leaders will discuss the role of offshore wind for the UK energy system, the importance of offshore wind for the local economy, the role of ports for the implementation of offshore wind projects.